By buying this product you can collect up to 6844 bonuspoints. Dieseldrivet motorvagnståg VT 11.5 TEE 4-delat, digitaldekoder med ljudmodul, totallängd över buffertar 88 cm, epok III. Prototype: German Federal Railroad (DB) class VT 11.5 'Helvetia' TEE diesel powered rail car train. Train route: Zürich Basle Mannheim Frankfurt Hamburg. 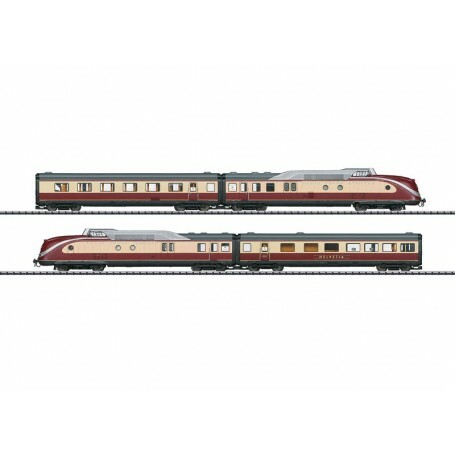 2 type Pw4ü powered end cars, 1 type A4ü compartment car, 1st class, 1 type WR4y intermediate car with galley / dining area. Classic crimson/beige TEE paint scheme. The train looks as it did around 1957. Model: The train is a 4-part set. It has a digital decoder and extensive sound functions. Each powered end car has controlled high-efficiency propulsion. Each powered end car has a truck with both axles powered. Traction tires. The intermediate cars have factory built-in interior lighting. The triple headlights and dual red marker lights change over with the direction of travel. They and the interior lighting will work in conventional operation and can be controlled digitally. Maintenance-free, warm white and red LEDs are used for the lighting. The train has a power pickup feature whereby power is picked up from the electrical pickups in the powered end car at the front of the train. The train has special multiple conductor close couplings and tight closing diaphragms with guide mechanisms between the cars. The ends of the train has a reproduction of the covered Scharfenberg coupler (non-working) at both ends. Train length over the couplers 88 cm / 34-5/8'. Highlights: The powered end cars and the intermediate cars constructed chiefly of metal. Digital decoder and extensive sound functions included. Factory built-in interior lighting with warm white LEDs. Many European railroads purchased powered rail cars for Trans-Europe-Express-service (TEE) that fulfilled the highest demands for comfort and that offered 1st class seating only. The DB decided on a powered rail car train based on the Kruckenberg VT 137 155 and the successful V 200. The basic configuration consisted of two powered end cars as well as five intermediate cars. This train could be expanded to a ten-unit consist by adding additional intermediate cars. The drive gear came from the V 200: Each powered end car was equipped with a 1,100 horsepower motor that transmitted propulsion to the wheel sets in the power truck by means of a hydraulic transmission and universal joint shafts. A 296 horsepower auxiliary diesel motor with a generator connected directly to it ensured electrical power exclusively for the galley and the air conditioning. The following was delivered in 1957/58: 19 powered end cars (VT 11 5001-5019), 23 compartment cars (VM 11 5101-5123), eight open seating cars (VM 11 ­5201- 5208), eight bar cars (VM 11 5301-5308), and nine dining cars (VM 11 5401-5409). The Helvetia linked the North of Germany to Switzerland since the start of the TEE network on June 2, 1957 and was among the founding members and thereby the first of the TEE trains. Initially, the new class VT 11.5 TEE diesel powered rail car trains were available for this routing (Hamburg Frankfurt Mannheim Basle Zürich). Yet as early as April 12, 1965 the Helvetia advanced to the first locomotive-hauled TEE in Germany, because with increasing electrification more and more TEE trains were converted to locomotive-hauled trains. The last of the TEE trains to be converted was the Mediolanum on August 20, 1972. From 1971 on, the TEE sets, designated as the class 601/901 from 1968 on, found new activity in the lntercity network. With the introduction of 2nd class in IC service, the class 601 powered rail car trains were once again without work for the summer schedule of 1979. A large part of these units was in use again in tourist service starting in the summer of 1980. These units with their elegant form ran as the Alpen-See-Express / Alps-Sea-Express from Hamburg and Dortmund to different South German and Austrian vacation regions, sometimes even as double units on certain parts of routes. The last use of the former TEE powered rail car trains as the Alpen-See-Express took place on April 9, 1988. Shortly after that, all of the trains were retired. The 22261 basic set can extended to a prototypical 7-part train with the 23261 add-on car set. An AC model of this basic set can be found in the Trix H0 assortment under item number 37604.